MAKE | GIVE | REPEAT is an online resource dedicated to helping hand-crafters find charities. Started by Robyn Devine and Heather Walpole simply because they love to support causes through their favorite hobby. That's me up there ... the one knitting a hat. I'm the one always knitting a hat, actually. My name is Robyn Devine. I'm a wife, a mama. I make hats and give them away. I've been knitting hats and giving them away since 2009, when I set a goal to make 100 hats using 100 different patterns over the course of a year. I finished that challenge a week before the self-imposed deadline, and never looked back! I blog about each hat on my website She Makes Hats. I love to make hats because hats are simple -- they take just one skein of yarn, can be carried with you wherever you go, and don't need any special measurements. Most people's heads fall under one of three or four sizes (baby, child, smaller adult, larger adult) so you can be fairly certain the hat you've made will fit one of these four sizes of person depending on the number of stitches on your needle. Hats can do quite a bit to keep a person warm. Little babies have a hard time regulating their temperature, so a hat can mean the difference between health and sickness. For folks living on the street, a hat can help stave off sickness in the coldest of temperatures. Naval ships run cold (something to do with all the metal ...) so a hat can help keep soldiers warm while on and off duty. Hi, I'm Heather Walpole. If you meet me you soon find out that I'm addicted to hand knits! I find myself most comfortable hunkered down with some yarn, a glass of craft beer, and my pups by my side, working on a new design to share with the world. My passion for quick and simple projects has helped me connect with a wide variety of knitters around the world, and thanks to my yarn company Ewe Ewe Yarns I'm able to make just about anything I want to wear year round! I'm excited to use my background in graphic design to help connect knitters and their hand knits with charity organizations. With so much need in the world today, we knitters have the gift of making that can be used to make the world a better place, and I believe it's my privilege to help in any way I can! The designs do not need to be elaborate or fancy. The simplest baby blanket can still cuddle a newborn. 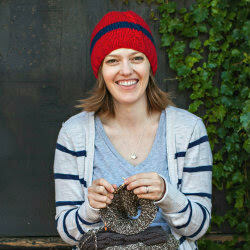 Knitters have a skill that hugs the world and I hope you'll knit along with Robyn and me. MAKE | GIVE | REPEAT was created to help knitters and crocheters find charities that they can support. While we aren't affilliated with any of the charities on this website we hope you find a match for your giving. Make and give with us! Show us your giving! Email photos to makegiverepeat@gmail.com or hashtag them #makegiverepeat on social media.